"Perhaps a man more experienced in reading the signs of a fickle climate would have seen the warnings written in the sky on that mid-winter Saturday morning in 1850. But the young Irish-born priest began his ride to Independence on horseback not expecting an unseasonably mild February to turn into a raging blizzard on Saturday. He had Sunday Mass to celebrate the next day at St. Mary Parish. The rain quickly soaked him to the skin as his horse plodded through mud, then rain turned to ice, then to a hard, blowing snow as the temperature plummeted. He passed just three houses on his way, but seeing no light, he pressed on. Drowsiness set in. The priest knew that giving in to sleep would mean certain death. He talked loudly to his only companion, his horse. He prayed, he sang, he slapped his cheeks and pulled at his hair - anything to stay awake and alive. Finally, as the priest neared the brink of unconsciousness, he felt his horse quicken his pace, perhaps recognizing a familiar landmark. He had made it to the edge of Independence. Hearing faint hoof beats, neighbors peered from their cabins to wonder that anyone would be out in such a storm. They recognized the priest, and pulled him inside to a fire. The next day, he was at the altar of St. Mary Parish, celebrating Mass. Such was the steel of the pioneer Catholics of western Missouri. One can only imagine how the history of Catholicism here, and even the history of Kansas City, might be different had Father Bernard Donnelly, the `Pioneer Priest,` perished that day." Founded in 1823, Saint Mary Parish is the oldest in the Diocese of Kansas City-Saint Joseph. Settled by Catholic pioneers and missionaries, Saint Mary has a long and interesting history. The church has survived uprisings among settlers of different faiths, raids by outlaws, and the Civil War. Though faced with many trials and tribulations, our founding settlers remained steadfast in their faith. The cornerstone of the existing building was laid in 1864 with the building completed in 1865. The cornerstone laying marked the departure of the first train from Kansas City which went to Independence for the purpose of carrying Fr. Bernard Donnelly, our first pastor, and five carloads of people to the celebration. 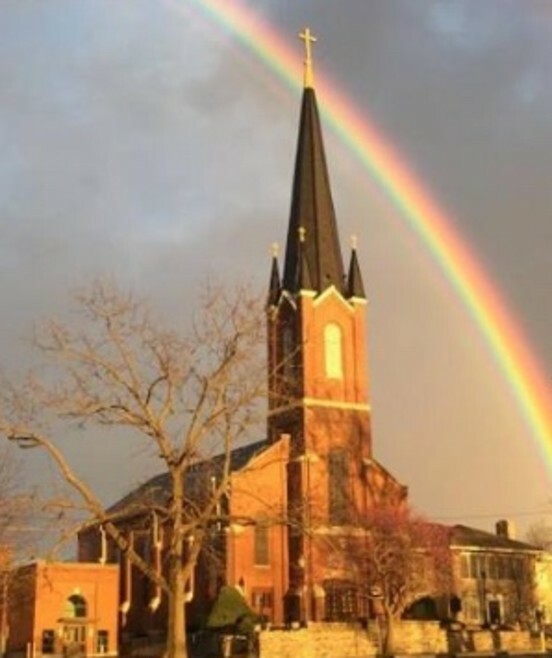 After more than 180 years, St. Mary Catholic Church still stands at the corner of College and Liberty Streets, calling to the community around to join in the glory of God that abounds from within its walls. We welcome new members every year and have an active, growing parish. In the tradition of Fr. Donnelly, today`s shepherd, Fr. Matthew Bartulica, leads this community in building a future for all. Come be a part of history! Come visit historic Saint Mary Parish in Independence, Missouri.